Later 18th / early 19th century, single- storey, rectangular-plan, 6 bays long, piend-roofed vernacular building of clay construction with some sections faced in stone, brick and cement render. Built as school, converted to church purposes 1929. NE elevation has earlier 20th century gabled porch of timber and corrugated iron, with gabled timber bellcote, flanked by later lean-to timber and corrugated iron bays. Accommodation within divided into one large room (originally schoolroom) and two smaller rooms and vestibule, which originally formed schoolmaster's house, to S end. Dado height timber panelling to former school room. Cast iron range to each smaller room. Slightly coombed ceilings. Mostly 4-pane timber casement windows; 12-pane sash and case window to SW elevation. Clay walls with render, stone or brick cladding in places. Piended Welsh slate roof. Brick ridge stack with thackstane to SW end, marking division between school room and smaller rooms. 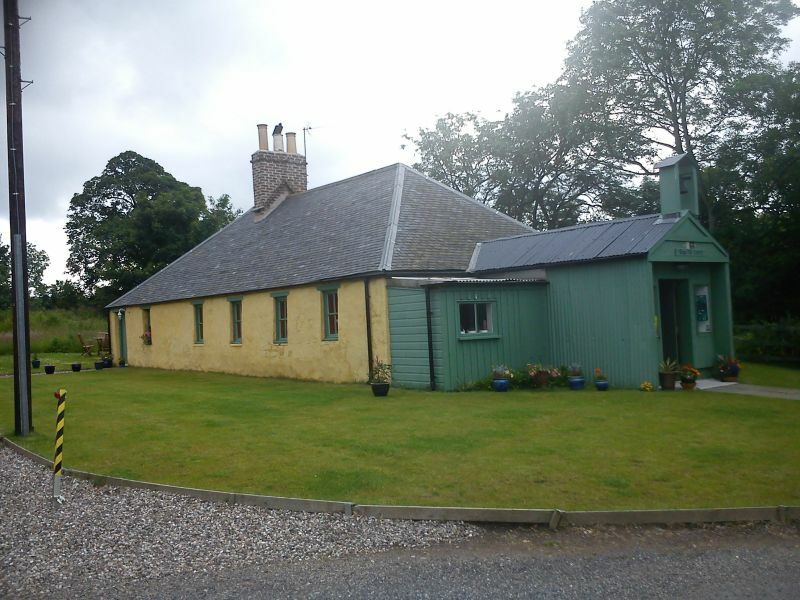 Logie School is a rare and remarkably complete example of the use of clay as a vernacular building material. It also has historical educational and religious interest due to its former use as a school and a church. The Old Statistical Account (1791) commented that the schoolmaster of Logie Pert had a free house and garden and taught between 40 and 50 scholars in the winter, 10 less in the summer; it is possible that this refers to Logie Schoolhouse. Alternatively, Logie Schoolhouse may be one of the 2 unendowed schools, mentioned in the 1834-45 Statistical Account, as built close to the mills in the early 19th century. The Schoolhouse was then used by the Free Church, and the United Free Church, from 1929 until the 1980s. C Craigo House Coachhouses, Doocot Etc.